Welcome to Auto-Fix Telford, your trusted vehicle service and repair centre. Your car’s safety and performance is our highest priority, so if you’re based in the Telford area, you can be assured that we’re confident in handling your car’s repair work or upcoming MOT. Since being established in 2003, we have gone from strength to strength and flourished as a local vehicle repair and servicing centre in the Telford area. Due to our unwavering customer focus and absolute attention to detail on all vehicles we service, Auto-Fix has become known for being competitive on servicing and quick on repairs. Our continued growth has seen us invest in a brand new MOT bay which has both the latest automatic testing lanes and diagnostic equipment needed for a professional job. If your vehicle fails, don't worry. 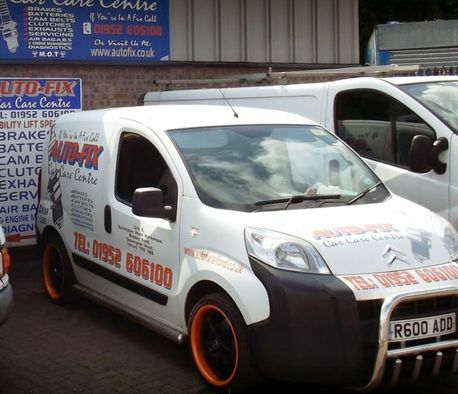 Auto-Fix Telford provides a free re-test within 14 days of booking. "We have been using Auto Fix now for over 3 years and they have been very professional and reliable. We would highly recommend this company to others in the local area." "Very affordable and brilliant customer service. They have a wealth of knowledge and I will be using again."